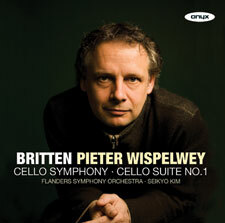 Pieter Wispelwey's first recording of Britten's Cello Symphony, of which he says: 'What a formidable powerhouse of a piece. For me now, this masterpiece stands among the very best in the cello concerto repertoire'. The Cello Symphony is coupled here with a masterful account of the 1st Suite for solo cello. Watch a video about this release here.